Discussion in 'Acer' started by Alex771, Aug 14, 2018. Yea, the temps on this are great if you re-paste. That was just a quick shot after 20 minutes or so of gameplay in Rise of the tomb raider on high settings. I can provide a full test data, that was just a quick shot to show how much my temps have decreased after a repaste (CPU would hit 100*C). I repasted. Figured something was really wrong because core would hit 100* after 5 minutes of gaming. Sure enough really bad thermal paste job. Can you please tell me what kind of paste you used? I have used TG Kryonaut but it did not make any noticable difference compared to the factory paste. Also I need assistance from people who know Insyde BIOS inside-out (get it? ). I have an unlocked BIOS so all settings all available. Now I want to add more undervolt and set PL1 70W / PL2 70W. How can I do this? I am not really familiar with Insyde BIOS. What do I need to set? However here I am stuck. 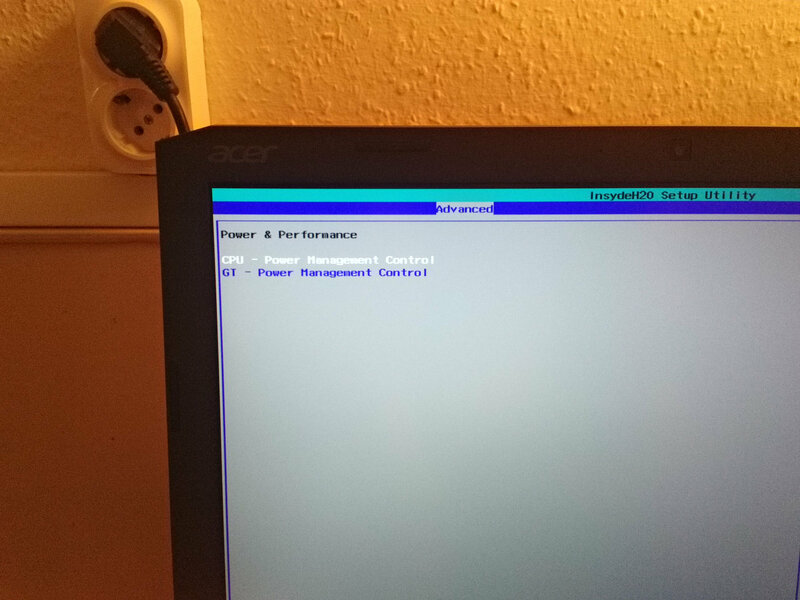 I have set Power Limit 1 and Power Limit 2 to 70W in the blue area (which can be edited) and then rebooted, however these settings did not get enabled because after reboot the factory TDP limits (45.0/56.250 in the black area) did not change to 70/70. What did I do wrong? What do I need to set? ps: A fair warning to anyone with unlocked BIOS. I have removed the factory installed cheap 2666 Mhz CL 19 RAM modules and installed better quality 2666 Mhz modules with cash latency 15. 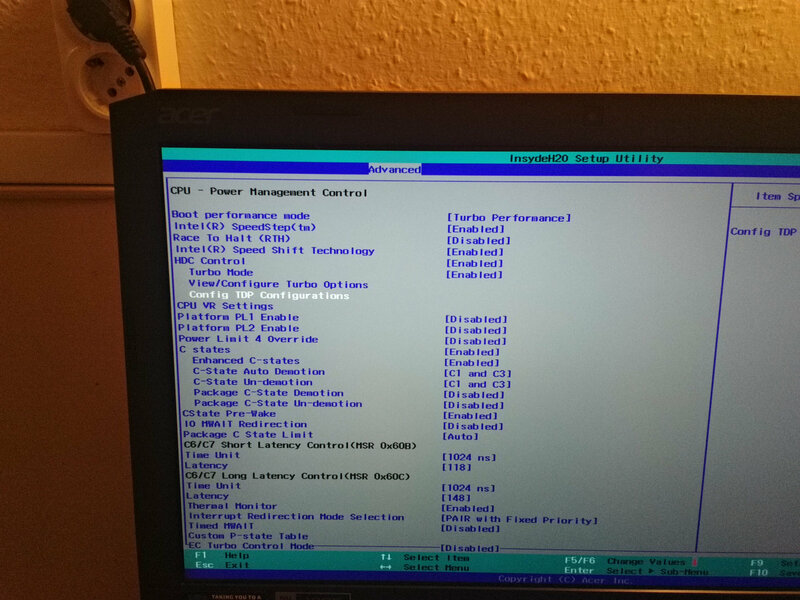 I have set these modules in the BIOS to run at 2800 Mhz @ cl14 however I have tried to run them at 3000 Mhz (You know, for science ), but the laptop refused to boot. 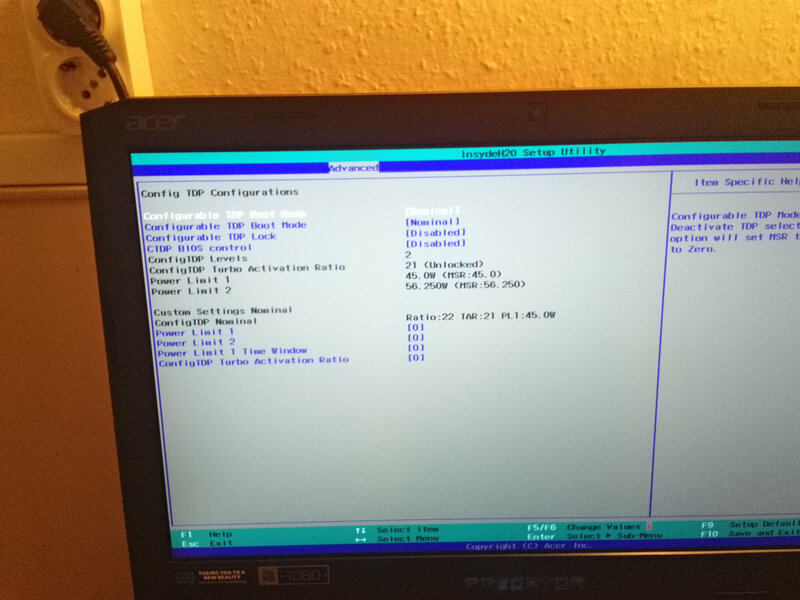 I have tried to sort the 2 pins responsible for CMOS reset, however the EC got so damaged from the above used RAM setting that even after CMOS reset the BIOS was not able to rewrite the default EC. Only solution was to reflash the entire BIOS with an SPI programmer. 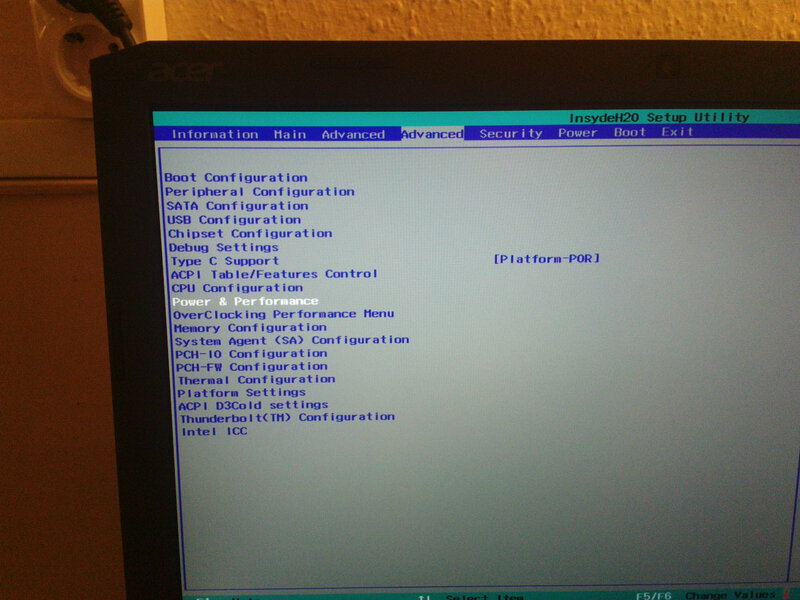 So be careful when you edit memory settings, it may brick your laptop which can only be fixed with an SPI programmer ! hmscott, undervolter0x0309 and vIkInG_w0w like this. @DRevan: How are your temps on the 500? Have you repasted it yet? Does it need to be repasted or can you tame the temps with Undervolting? Also can you provide more info about the Insyde Bios. Never heard of it before. Thanks. Temps are great, my girlfriends only hits 60ish once gaming for several hours, automatically has special Acer keyboard buttons to ramp up fan speed also. Wow, those are great temps? Did you do any undervolting or is this stock? Thanks. If Predator Sense is installed, that automatically applies -125 mV undervolt when CPU receives high load. I'm buying one of these very soon(the I7) version. Are there any nagging or unresolved issue with this laptop? I got burned with the Asus Scar II(GL504GS) so I'm apprehensive.